Now wewe can see what Fiona's saying:). . Wallpaper and background images in the Miles "Tails" Prower club tagged: tails sonic sally fiona. That what Fiona gets though,She was mean to Tails!Though shes still Kool! YOU BROKE MY HEART FIONA!!! 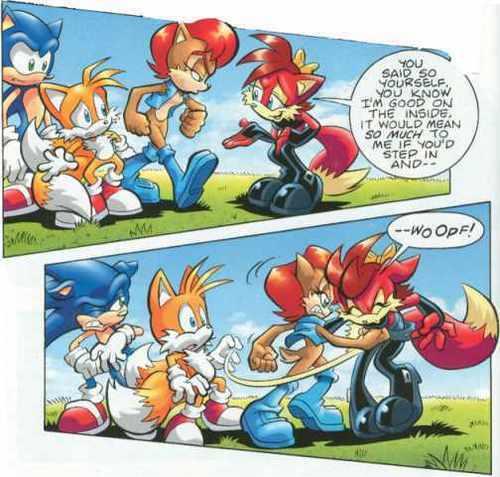 HOW CAN YOU BE SO MEAN TO TAILS YOU WEIRDO!!!! Looks like something I would do if someone treated my friend like that. Die, Fiona, die! How could you be so mean to Tails?! He never did anything wrong! yeah he is a nice guy to have as a friend and you don't have to be so mean to him! IN THE GUT!!!! THATS WHAT YOU GET!!! HA! "My only time to compliment Sally has come." But it is so fuking weird that Tails love her so much !!! I would do this too ! She deserves to get punched in the bread baskets!!!! SHE'S LUCKY IT WASN'T ME WHO DID THAT CUZ IT WOULD BE A RAP FOR HER!!! Really real TALK!!! !